It didn’t take long for Minooka TAP to decide that our second trip would be to Greece. Greek Mythology was a big part of our school’s 7th grade literature curriculum, and our 6th graders study Ancient Greek History. At the time, Rick Riordan’s The Lightening Thief was one of the hottest books in our school libraries, so it seemed our kids were primed for a trip to the Mediterranean. We made plans to travel during spring break of 2008, extending our adventure to 12 days, two days longer than last year’s trip to Germany. We selected a fantastic group of 26 students and a handful of parents to take with us on our journey around Greece and the islands. Miss Massey was once again our fearless leader, while Miss Hanley and Mr. Curtis came back for a second trip. Mrs. Harig (7th grade social studies) and Mrs. McKerrow (7th grade math) were added to our group. Our first stop was supposed to be Athens. We were going to have half a day exploring the ruins of the ancient city before getting on a cruise ship and jetting around the Greek Isles, but things got a bit wonky. Instead of exploring Athens, we wound up with half a day half a continent away – in London, England. It was quite the little bonus adventure, making the trip that much more memorable, because no one expected to see Big Ben and the Tower Bridge during our trip to Greece. You can read more about that crazy day here. 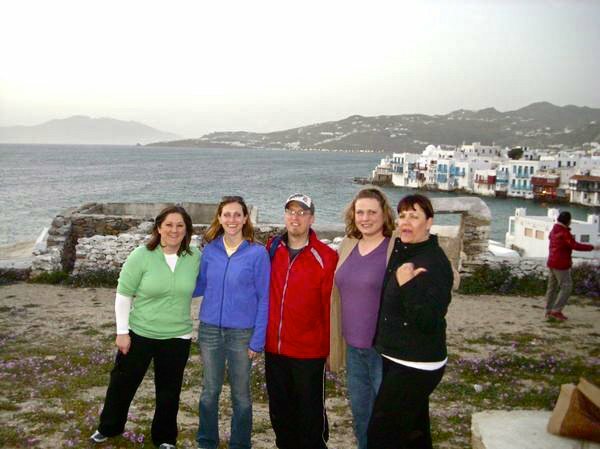 When we finally did arrive in Greece, we didn’t have a whole lot of time before boarding our cruise ship. We were worn out from the flights, as well as the English excursion, so our tour director – Elaini – took us straight to the hotel. We only had time for a few hours of power napping, before it was time to board the cruise ship. Most of us were too excited to sleep. The cruise ship was like an entirely different world to me. I’d never been on a cruise, so I had no idea what to expect. It was like a floating hotel resort – there were our rooms, of course, but also a theater, a casino, a basketball court, a few pools, a night club for teenagers, a night club for us older folks, and all sorts of different ways to pass the time and get ourselves in trouble. Fortunately, we had a great group of travelers and trouble avoided us for the most part. The first island we stopped at was Mykonos, which is known for it’s cool old fashioned windmills and a fantastic night life. 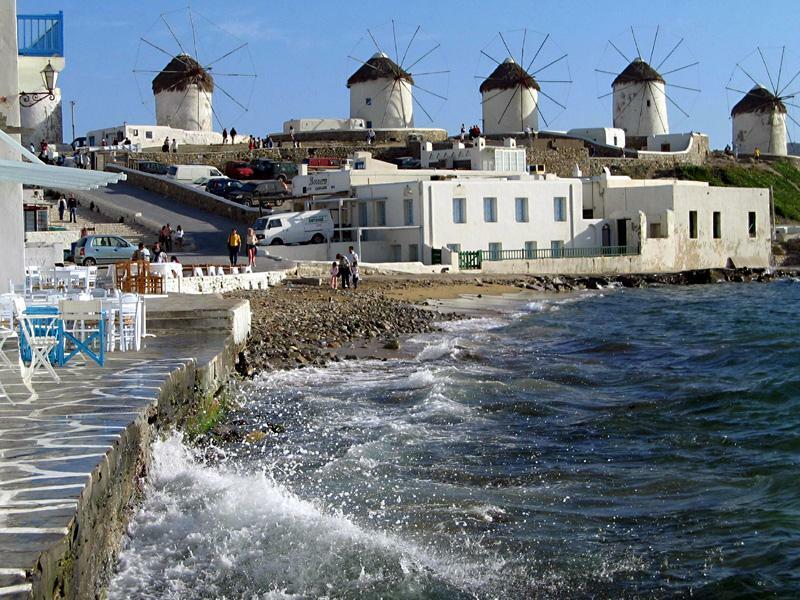 Little shuttle boats brought us from the big ocean liner to the shore, and they were scheduled to bring us back to ship long before night life came alive, so it was up to the windmills to make Mykonos a memorable experience. This is also where we first tried Greek food. Up until then, we’d had airplane food, airport food, and cruise ship food, so it was nice to eat something not involved with mass transport. Of course, living in Chicagoland most of my life, I’d had Greek food before, but not Greek Greek food. What I’d eaten was American Greek food, which is like trying to pass off a Big Mac as representative of high quality U.S. beef. Traveling makes you hungry. The chance to try new foods sometimes makes even hungrier. Being a fourteen year old boy means you’re the hungriest. So, the crowd of fourteen year old American boys who spotted the little gyros stand from three blocks away was sort of like a tame version of the zombie apocalypse. I was lucky I didn’t lose an arm in the melee, but I managed to get myself a gyros too. I only have one comment – to this day, that gyros was the best thing I’ve ever eaten in a foreign country. Our next stop was Kusadasi, Turkey, a port city with a fun history, an awesome market place, and a cool old fortress to protect the port from pirates. We had a bit of extra time in Kusadasi, because some bad weather out on the open sea prevented us from departing on time, but we took advantage of every second we had there. One of the highlights was the demonstration on how to make Turkish carpets, which the kids loved. Almost everyone bought a small souvenir carpet to remember the experience by, then they let us loose in the marketplace. That was TAP’s first experience with bargaining and haggling. We were wheeling and dealing like crazy, trying to get the lowest possible price on our Turkish trinkets. Sometimes it wasn’t even about the money, just the fun of the haggling game. One of the optional excursions offered to us on this adventure was a little side trip out to the ancient ruins of Ephesus. Ephesus was one of the coolest places I’d ever seen. There wasn’t much left of it, but we learned about the homes, business, public forums, and meeting places of the ancient city. The library facade was massive, leaving one to wonder how people were able to build something so big back then, as well as how something so massive met it’s end. One of the best parts was stopping at the home of Mary – no last name necessary, because it was that Mary, Jesus’ mom. An unbelievable experience. Once the storm calmed down, we headed for Rhodes, the alleged site of one of the Seven Wonders of the Ancient World – The Colossus of Rhodes – and what the locals claimed to be one of the world’s dumbest animals – the Rhodesian deer. Rhodes was one of my personal favorite spots on the trip. To stand where the Colossus may have stood and debate whether or not it existed was cool, but the best part was entering the walled city and walking around the castle’s dry moat and hearing the many stories of generals who failed in their attempts to seize Rhodes. The Palace of Knossos was our favorite part of visiting Heraklion in the island of Crete. The palace was built by King Minos of the ancient Minoan people, fierce warriors with an unstoppable navy. His temple was in ruins by the time we got there, but even so, it was a maze of corridors and walkways going every which direction. It was this confusing mess of a palace that spawned the myth of the labyrinth, an endless maze that was the home to a horrible monster – the Minotaur – a terrible creature that was half bull (taurus) and have human (mino, like King M. himself). While we were there, we got to see archaeologists hard at work carefully uncovering a section of the ruins that hadn’t seen the light of day since a tidal wave wiped out the Minoans thousands of years ago. The tidal wave that supposedly wiped out both Ephesus and Knossos originated on the volcanic island, Santorini. 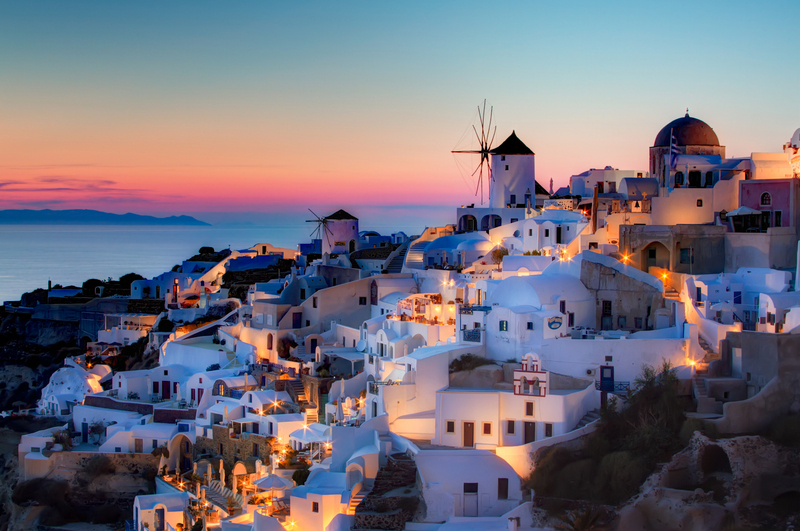 Legend has it that Santorini was once a round shaped island, but today the largest island resembles a crescent shape. There’s a volcano down there under the sea, and our cruise ship parked right above it. Thousands of years ago, there were people living on Santorini, but a huge eruption destroyed their civilization (along with Knossos and Ephesus hundreds of miles away). The Santorini people were gone just like that, some believed that their part of the island sank to the bottom of the sea – and so began the legend of the Lost City of Atlantis. Modern Santorini is just about the most beautiful place I’ve ever been. I have to admit, I didn’t enjoy the donkey ride up the winding cliff-side path to get to the up to the town, but all of the kids opted for donkeys instead of cable cars, so we donkeyed our way up. We watched the sun set on the Mediteranean, it’s light gleaming off the white and blue buildings, making every moment a perfect postcard picture. Back on the mainland, we made Athens our base of operations. Of course we visited Acropolis, the Temple of Zeus, and the Temple of Hephaestus, but we also hung out at a Greek carnival, went bowling one night, and strolled through the Athenian market. Delphi is just a short day trip up into the mountains from Athens. It’s well worth the drive, too. 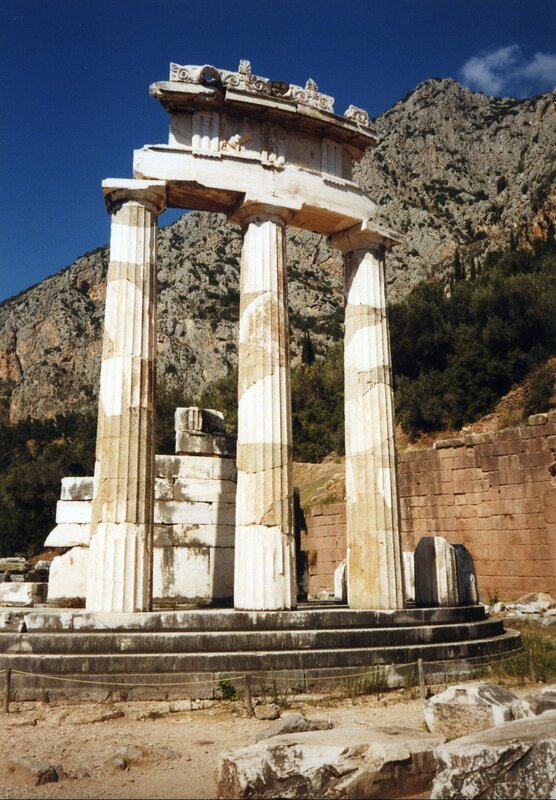 Delphi wasn’t a typical Greek city, instead it was a sort of central office for all religion. I was always under the impression that all the Greeks believed in a worshiped all those gods and goddesses from mythology, but it was more of a “pick and choose” sort of thing. Athenians loved Athena. Sailors and fisherman worshiped Poseidon. Blacksmiths made offerings to Hephaestus. Soldiers paid homage to Ares. Sort of like modern day allegiances to sports teams, which god you worshiped depended on where you lived, your family, and your occupation. Delphi seemed to be a place where all the gods and goddesses were represented. It was a beautiful city built right into the side of the mountain, and the view was incredible. Walking up the path that weaved between the ruins was awe inspiring. Our last visit on our Greek Adventure was Cape Sounion, a coastal town outside of Athens. There we saw one of the most complete temples of our whole trip – beautifully situated on the cliff jutting out into the Aegean Sea was the Temple of Poseidon. We learned that the Aegean was named for King Aegeus, who threw himself into the sea when he believed that his son, Theseus, had been killed in his battle with King Minos’ Minotaur. Theseus had lived, but had simply forgotten to change the color of his sails, a signal he’d arranged with his father so the King would know as soon as his son’s ships came into sight if Theseus had lived or died. Huge communication breakdown, but an interesting way to name a body of water. Overall, our trip to Greece, Turkey, and the islands was an amazing experience. We sailed the same sea as Theseus, Odysseus, and Jason and the Argonauts. We walked in the footsteps of Mary, King Minos, and perhaps Zeus himself. We ate our weight in gyros, saw an amazing music and dance performance, and fell in love with Greek culture and the people. I hope someday I’ll be lucky enough to get back to Greece again.